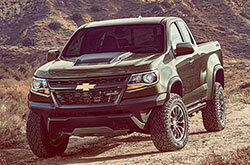 The Chevy Colorado may be compact but it's the big dog of the small truck segment. Colorado bests the competition when it comes to efficiency, power and features. With class-leading mpg and horsepower, and segment-exclusive equipment, it is hands-down a top choice among trucks for sale in Springfield, Missouri. Additionally, it gets a thumbs up from owners, as indicated by its 2017 Autobytel Buyer's Choice Award--Best Small Truck category and other many accolades. Continue our 2018 Chevy Colorado review for more details. What Features Are on the Chevy Colorado? 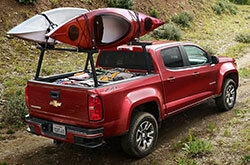 Colorado offers versatile configuration options to help you purchase the perfect pickup. For starters, there are Extended and Crew Cab models, both of which come with a long 74-inch cargo box. 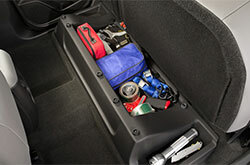 Buyers can also choose a Crew Cab model with a shorter 61.7-inch box. Extended Cabs are available with a choice of 4WD or 2WD, while Crew Cabs are solely available with 2WD. In addition, several trim levels are available depending on your cab and drivetrain choice. There are five trims total: the base Colorado, Colorado WT, Colorado LT, Colorado Z71 and Colorado ZR2. If you purchase a new 2018 Chevy Colorado in Springfield, you'll be impressed by the lineup's ample amount of standard amenities. A few notable features include the MyLink touchscreen audio system, Bluetooth Hands-Free Phone and Audio Streaming, a backup camera, and Apple CarPlay and Android Auto. 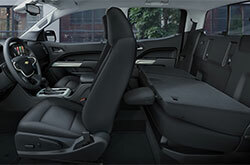 Upper trims add on even more premium amenities, such as heated front seats, remote start and available Wi-Fi. Additionally, all Colorado models with a V6 or turbo-diesel engine now come standard with Active Tow, a new feature that helps drivers align the truck with a trailer when going in reverse. Colorado tops other compact trucks in several key areas. Its 275-torque, 3.6-liter V6 engine delivers a class-leading 308 horsepower, while its class-exclusive 2.8-liter Duramax turbo-diesel engine offers segment-best fuel efficiency (22 city/30 highway mpg with 2WD). The turbo-diesel, which gets 181 hp and 369 torque, also happens to offer a best-in-class 7,700 max tow rating. The base 200-hp inline-4 is a respectable choice as well, but 2018 Chevy Colorado reviews suggest upgrading if you're looking for enhanced capability and efficiency. What Safety Features Are on the Chevy Colorado? Colorado not only offers dependable performance but also dependable safety features, including six airbags, stability and traction control, and tire pressure monitoring. 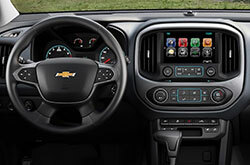 Select Chevy Colorado models also offer the OnStar Guidance Plan with turn-by-turn navigation, roadside assistance, automatic crash notification and stolen vehicle assistance. A five-year OnStar Basic Plan is included on select models as well and offers advanced diagnostics, maintenance notifications and mobile app features. 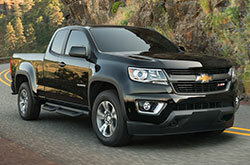 Want to Learn More Info About the Chevrolet Colorado? Considering a new car own in the Springfield area? If so, don't just take a look at the 2018 Toyota Tacoma, Honda Ridgeline, Nissan Frontier and the GMC Canyon; be sure to consider the dashing 2018 Chevrolet Colorado along with these options. Due to its features, winning styling and enchanting persona, it could be just the vehicle for you. Once you've acquired the facts facts and figures you want for the 2018 Chevrolet Colorado, browse our site to find information about exclusive incentives from Reliable Chevrolet. We're a local Chevrolet Colorado dealer with a wide collection of vehicles and manufacturer incentives for judicious shoppers. We've provided this 2018 Chevrolet Colorado review because it's important to make an intelligent decision when you're shopping for a car. You are certain be in awe when you visit Reliable Chevrolet to test drive the Chevrolet Colorado; we encourage you to come experience the model upfront. Are you hoping to get a peek at its cabin amenities before your visit? See the enclosed video.